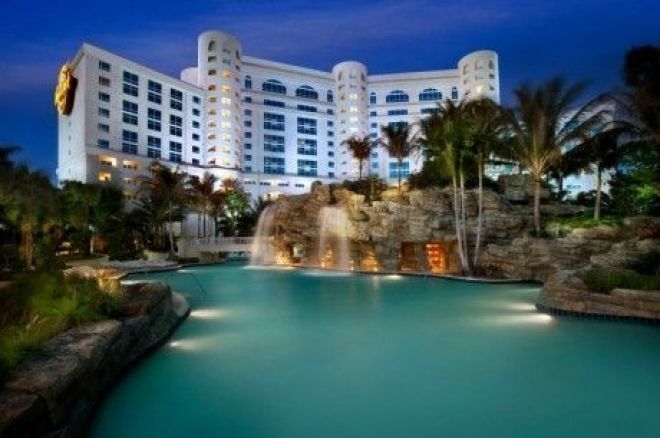 Day 1b of the $3,500 World Poker Tour (WPT) $5 Million Guarantee Seminole Hard Rock Poker Showdown is in the books with 205 of the 542 entries moving on to Day 2. The total number of entries now sits at 1,021. In order to make the guarantee, the WPT will need to see another 530 players register on Day 1c. Leading the way on Friday was Melad Marji with 297,900 chips. Following closely behind were Timothy Banks, Jonathan McCray, Stuart Breakstone, and Garrett Greer. Others moving on to Day 2 include Dan Heimiller, Jake Cody, Shawn Cunix, James Calderaro, Dan Shak, Bobby Oboodi, Eric Hershler, Mike Sexton, Vinny Pahuja, Kevin Saul, Ravi Raghavan, Jason Mercier, and Canadian Paul Klann. Some of the not-so-lucky players busting on the day with one last shot on Saturday’s Day 1c were Marvin Rettenmaier, Matthew Waxman, Matt Giannetti, Joe Serock, Phil Laak, Mike Sowers, Mike Linster, WPT POY points leader Mukul Pahuja, Canadian Nenad Medic, Calvin Anderson, Allen Kessler, Jeff Gross, Jeff Madsen, and Dylan Wilkerson. The last Day 1 starting flight will begin at noon in South Florida. Players can register as many times as they need until the end of Level 6. Check back at the end of play to see a full end-of-day recap and and a look at what Day 2 should bring on Sunday.